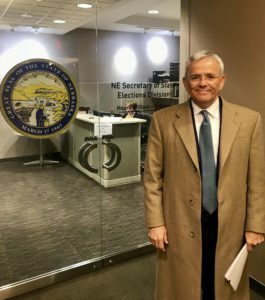 Yesterday afternoon, Jan. 29th, Steve Lathrop officially filed to represent the 12th District in the Nebraska Legislature. Lathrop previously served 8 years as a State Senator from District 12 from 2007 to 2015, including six years as Chairman of the Business and Labor Committee. Lathrop has overseen reforms of the Beatrice State Developmental Center, Nebraska’s unemployment insurance fund, and was selected by his legislative colleagues to oversee the major investigation into the Department of Corrections.